Each room is covered with frescoes which evoke the atmosphere of the Italian island. Calabrian cuisine makes a great change from the standard Roman fare. Don’t expect a menu: you’ll eat what Ada has decided is good that day. It’s basic – and it’s fabulous. 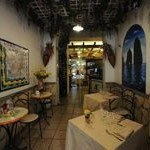 A useful, inexpensive Trattoria to know of if you’re in the area – and the house wine is eminently drinkable. By no means cheap, especially by Italian standards, but the atmosphere is refined, and the quality and invention coming from the kitchen is worth it. Very basic, very good and very cheap.